We made it! After 3 flights and fun times sprinting through a couple of airports, we made it to South Lake Tahoe!! Our journey started at 3AM in Orlando, which meant getting to Tahoe right after lunch time. That was amazing and well worth waking up in the middle of the night for!! After landing at Reno-Tahoe International Airport however, it was all easy and pampering – we were in true family vacation mode, thanks to our partners at Tahoe South hosting us on this trip! We had pre-arranged our airport transfer with South Tahoe Airporter and were at our hotel in no time. No need for Christian to drive into Tahoe, me figuring out the best route, or either of us worrying about driving conditions. There was no waiting in line for a car rental, and South Tahoe Airporter was super easy to find at the airport (located right behind the National Rental Car booth). We were dropped off right at our hotel – Lake Tahoe Resort Hotel – and started the most wonderful family vacation!! It was our first family ski vacation in the U.S., and surely won’t be the last. 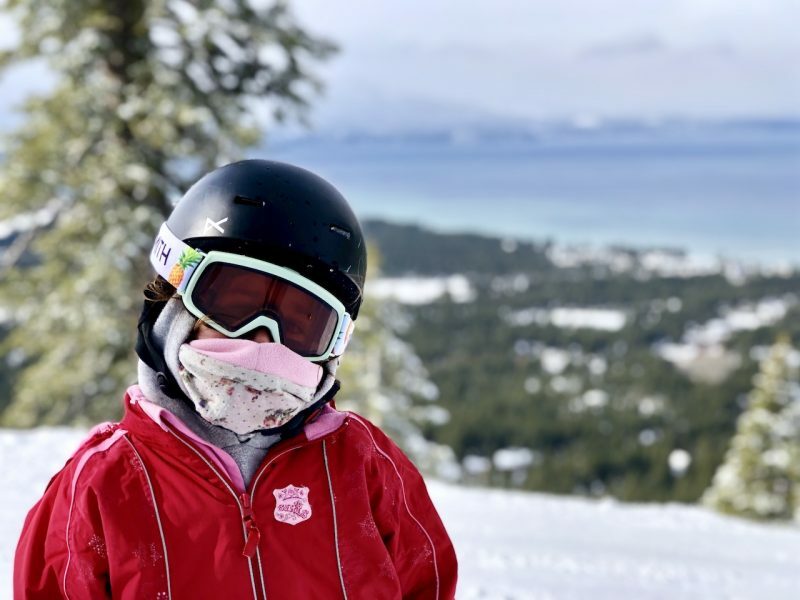 We were so impressed with how much South Lake Tahoe has to offer – it quickly became one of our favorite places for a family adventure. 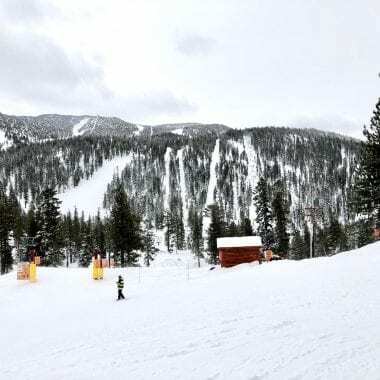 If you are hoping for lots of time outdoors and a large variety of activities, then South Lake Tahoe is for you! Here is all the fun we had on our first 2 days! The kids were just so excited to finally be back in the snow. Imagine how hyper those 3 kids were, coming from Florida, and missing their lives in Germany every day for the last 2.5 years. 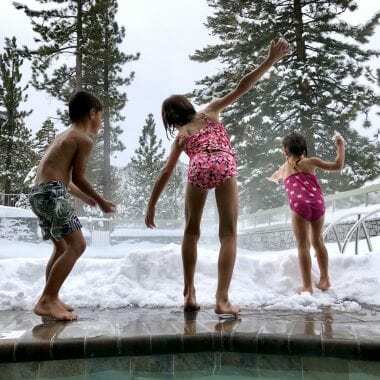 They were in a Florida pool a couple of days ago and got to make snow angels a few hours after getting to South Lake Tahoe! Our check-in at Lake Tahoe Resort Hotel was super quick and we had a room on the 6th floor, overlooking falling snow. We had a ton of space with a one-bedroom suite and it felt super spacious! Our first stop was at the ski rental kiosk in the hotel lobby. We had pre-ordered our skis, shoes, poles, and helmets on RentSkis.com and loved that everything was waiting for us after 3PM! The kids were so excited to get fitted for and try on their equipment! They immediately asked that we take them skiing. Since it was getting late at night, we headed just behind the resort where they went down the snowy hill for over an hour. After a long long day of travel and nearly 2 hours of ski and snow play, we headed back to the room and ordered in a wonderful pizza. Our suite had a large table and kitchenette, perfect for a relaxing dinner in! We ended the night enjoying the hot tub, watching the snow fall outside and we all collapsed in bed, happy and tired! All reservations at Lake Tahoe Resort include a yummy warm breakfast buffet. We filled up before heading out to the ski slopes! Lake Tahoe Resort Hotel is perfectly located for easy access to the Heavenly Gondola. It is just 2 blocks away from the hotel and a very easy walk with ski shoes on. Unfortunately, due to weather conditions, the Heavenly Gondola was closed for entire duration of our stay. Icy winds made it unsafe to operate. No worries! We were told to hop on the free Heavenly shuttle to catch the California Lodge chairlift. The shuttle picks up and drops off at the transportation center, which neighbors the Lake Tahoe Resort Hotel – it is literally steps away!! The California Lodge chairlift at Heavenly was AMAZING!! We skied, with all three kids, for 4 hours. The snow was wonderful, fresh powder. We went down Maggie’s multiple times – a green trail, perfect for families, and explored more of the area. Ava and I also ventured in the powder on a red trail and she did amazing! We also spent the last 30 minutes of our day at the magic carpet, located right at the bottom, by the California Lodge chairlift. The kids went up and down and worked on their skills before we headed back to the hotel. We were so impressed with our day of skiing at Heavenly! Everyone working there was amazing with the kids. They slowed down every chairlift we sat on, lifting the children from behind to make sure they were securely sitting. And the kids left, begging to come back for more the next day! Related: Watch our video – Family Ski at Heavenly, Lake Tahoe! After a full day of ski, we couldn’t wait to head down to the hot tub and relax a bit before heading back out. We then headed over to Heavenly Village, which starts just a block away from the Lake Tahoe Resort Hotel. Many restaurants offer happy hour menus and we had amazing burgers and cocktails at a local burger company. Motivated to make the most out of our short time in South Lake Tahoe, we headed over to the Loft for a mind-blowing magic show! We have seen many magic shows, but this one was exceptional with unimaginable tricks and hilarious jokes, and totally safe for the little ears! With the long trip the day before and our 3 hours of time difference, baby Elin did not quite make it through to the end of the show. That is the beauty of family travel and what makes the best memories! That ended our first two days in South Lake Tahoe! What is your favorite family ski resort?